Sites@Duke is pleased to offer a new Duke School of Medicine branded theme. 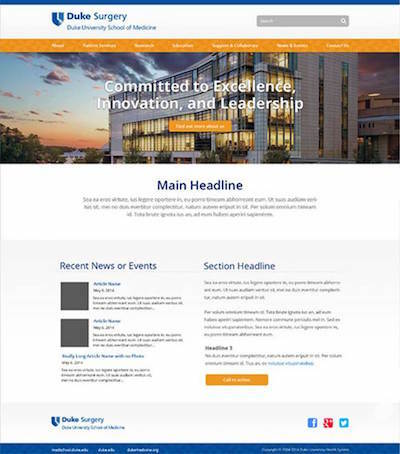 Users affiliated with the School of Medicine may choose this template when selecting a theme for their sites.duke.edu WordPress sites. The image below shows a sample site using the School of Medicine theme. Please note the logo in the top left corner can be changed to the School of Medicine or appropriate departmental logo, or group/unit name. This entry was posted on Thursday, February 5th, 2015 at 10:26 am	and is filed under News. You can follow any responses to this entry through the RSS 2.0 feed. Both comments and pings are currently closed.